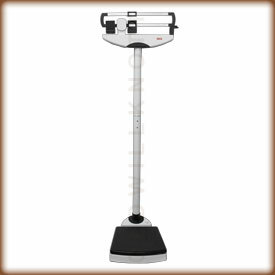 Easy To Use Weight Beams Once the scale is set up, weighing will be a very simple task. All ya need to do is step on the medical scale, slide the larger weight to the approximate weight area, then do some fine tuning with the smaller weight. You'll want to keep manipulating the smaller weight until the hand and counter-hand, on the right side of the balance beams, line up. Tare And Fine Tuning Knobs This mechanical doctor scale has a tare knob on the bottom of the large sliding weight, and a fine tuning knob on the side of the beams, that lets you set the balance to zero before you weigh. This can come in handy for accurately measuring weight even with a weighing pad on the scale. Easy Transportation Seca equipped this hospital scale with rolling castors on the rear of the platform to help ya move it from place to place without taking it apart. No Batteries Here You won't have to ever worry about running out of battery power, or trying to find a wall outlet, with this beam scale. This scale's two beam design allows you to accurately weigh patients, in as small as 1/8 pound graduations, without a digital readout. 5 YEAR MANUFACTURER'S WARRANTY! Seca offers a five year warranty against defects in materials and workmanship. In the rare case ya have a problem with this scale, contact Seca for a repair or replacement. the scales got here quickly and were easy to assemble and are very professionally built and accurate. thanks for your service and you even gave a phone # I can call if I have a problem. The Seca 700 is accurate, easy to setup, and has a high quality look to it. It is such a pleasure to step on a scale that you know will provide an almost instantaneous feedback on whether you have gained or lost weight since the last reading. Fine tuning to exact zero was quick and all I needed was a flat headed screwdriver. Shipping was fast. I am very happy with my purchase. The scales were exactly what we ordered and we love them. Also, ordering was easy and quick. The customer service was very friendly and professional. I am a very proud owner of a Seca 700 pound scale. It is very easy to assemble and calibrate. If you have tile in your bathroom, just make sure not to set the legs on a grout line. It is a very accurate scale at a very good price. Checked out all of the sites that you could purchase a scale, and read all the reviews. Once you establish what your weight is, you always get the same reading, no matter how may times you get on and off the scales. It was shipped on time, and was in very good condition. It looks really nice in my bathroom. If you are interested in losing a little weight, or just keeping track of your weight, this is the scale to buy. You won't be disappointed. I would give it more than 5 stars if I couls. Highest quality I could find; form, fit and function all excellent. Even the packing was impressive. Assembly is simple, requiring only a phillips head screwdriver. The only fault I find is the crappy instructions. You don't need them to assemble this scales, but some words on how to use the fine adjustment screws would be nice. Nevertheless, I'm extremely happy with the device, and the service from Old Will Knott was spot on. First of all, can't believe how fast this was delivered and this was the best price we found on the internet. Great service - thank you. The scale itself is exactly as we had anticipated based on many reviews. We checked the accuracy using two 45 lb. lifting weights. At first it seemed 10 lbs. off but the scale was not sitting squarely on our tile floor (one side was on a grout line). After correcting this, everything was fine. It weighs very consistently and looks good in our bathroom. Very satisfied. They work fine, easy to assemble, arrive on time,Thank You. Our Seca scale arrived quickly from Old Will Knott. Even though the assembly instructions are entirely pictures, the scale was assembled and balanced in about half an hour. Remember your high school or college days using a triple beam balance scale? That could help you in understanding this scale. Calibration is by turning a screw with a flat blade screwdriver and/or by using an enclosed Allen wrench for more drastic calibration movement. I only had to use the screwdriver a turn or so to bring the scale into balance. It would be nice to verify the accuracy of the scale by weighing a large, known mass, but where would you find such an object? The floor in my house that this scale sits on is wood and a little uneven. Use a level on both the scale and your floor to tell you if any of the 4 rubber feet need to be shimmed a little. These feet don't appear to be adjustable. Best of all, I've already lost 5# because my old scale was that far off. I am happy with my purchase so far. I received my new scale just a few days after ordering and found the scale very easy to assemble. The unit works great and I am very happy with it!